Have you been wanting to learn balayage but can't find a class in your area? Do you feel like balayaging is a guessing game? Never quite sure how it’s going to turn out? Do you like to play with balayage but lack the confidence to charge your clients for it? Does your balayage come out with marbling or patchiness? Do you want to learn to paint without other people in the class watching you figure it out? Have you been to big shows and group classes and left feeling like you didn't learn any specific skill to take back to your chair? Do you want to master this beautiful timeless skill thats in high HIGH demand? Do you want to learn a technique that will allow you to create more revenue for your business? Do want to elevate your business and take your career to the next level? Now, while I was fortunate enough to have worked for a salon that taught balayage, I still struggled at the beginning! I’ve been there! I was told early on that I was a “natural” so NATURALLY I developed a huge ego and tried to skip steps and act cool and let me tell you… it SHOWED in my work! I had marbling, bleeding, patchiness and placement that just made NO sense at all! Once I took a step back at looked at the problem at hand, I went back to the fundamentals and slowed down and what do you know? I got better! One day it just clicked! I realized I had gained the dexterity and confidence in my skill and I was no longer tense and stressing through each balayage. I no longer got massive anxiety every time a balayage showed up on my books. I knew I had the confidence to paint any and everyone, and the skills to back it up. My clients took notice and the referrals haven't stopped rolling in since! I now use balayage not only as a service, but as an add-on to color services and even as a corrective color tool! It really helps me fully customize all my clients hair and its actually one of my favorite ways to correct color now. Besides being a popular service right now, balayage is also a MASSIVE source of income. If you're not offering Balayage you're missing out on a HUGE market! Balayage is a technique that requires investment. YOUR time and money are going into learning and mastering this technique for your beautiful clients, and your price for this service will reflect that! My income shot up immediately when I added balayage to my service list. Even when I was slow at it in the beginning, it was still a bigger ticket service that was worth the time! As my skills developed my timing naturally shortened and my balayage clientele grew! Within two years my income DOUBLED! I do believe we will always use other forms of highlighting for various reasons and looks. But balayage is the technique that will take your career to the next level. Just a few words to those of you who are looking over Jessica Willburn's course and wondering if it's worth it or if it's just another so so video course. I had the same reservation's and many questions. Jessica is a very real true and understanding person, stylist. And knows our needs and any technique issues we are having with balayage. I took this course and I'm so glad I did. Jessica's course gave me the confidence I needed in doing balayage and took the guess work out of the equation. What's good about it is you can go back and watch any video anytime you want to refer back. Her videos are very clear and easy to follow. I have learned placement for balayage and have applied her techniques to even smaller added on services to color clients by adding on a few classic pieces painted on while getting their color done. Jessica was always available to answer any questions along the way as well as the other students who you can share with and get encouragement from on the dedicated FB page. Their is always room for education no matter how long I've been in this business, which had been a long time! She's given me the tools to work with. Now it's up to me to make the most of it. This course was a game changer for me. If your still on the fence about it you can ask her any concerns you have on taking this course she will answer you promptly and honestly. I personally had no hesitations at all when signing up for Jessica's course because I have been lucky enough to get to know Jessica personally. First I job shadowed with Jess, then I took a one on one class with her, now I just finished her six week balayage course!! I can't even begin to tell you how much my life as a stylist has evolved since my journey with Jessica started. She is a absolutely wonderful colorist and I trust her opinion completely. She is very honest, constructive and you can really tell how much she enjoys teaching other stylists which makes learning THAT much easier. In March of this year, I moved salons. I went from a salon where I was working full time as an assistant to other stylists and part time taking my own clients to being full time behind the chair. My confidence in balayage before I started working with Jess was pretty nonexistent. I am a total perfectionist and I didn't learn any basics in school at all and every time I would do a balayage I would just cross my figures and hoped I was doing something right. Since taking the course I feel myself painting with ease. My confidence is flourishing. I completely feel like I know the "whys" now. All I want to do now is paint!!! The best thing about working with Jessica is JESSICA. I have not met a stylist, or anyone else for that matter, that has as much drive and that is as accountable as her. She responds to me almost as fast as I ask a question. What I have learned is ALREADY effecting my future in a positive way. I have more confidence and lots of new balayage clients because of what I have learned from these courses and what I have learned also on the social media marketing side from working with Jessica. DON'T BE. You will NOT regret it. Jessica has been such a inspiration for me, not just in hair but in life as well. She is a wonderful human. In this journey for me as a new stylist, I have been looking for someone who is extremely knowledge with color to learn from and work with, and I HAVE FOUND HER. The first day I job shadowed with Jess, I knew I needed to learn as much as I possibly could from her. She challenges me and is honest with me and that is the kind of person WORTH learning from. 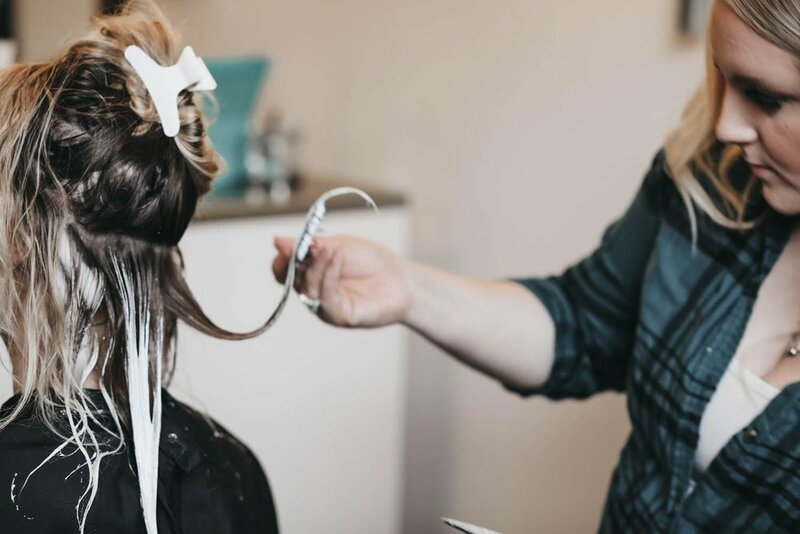 This industry is one that is constantly changing and evolving and if you feel like there is room for improvement with your balayages TAKE THIS COURSE. You won't regret it! Education. Learn to execute this timeless technique with skill and confidence! Technique. Nine in depth classes covering sectioning, placement, pressure, and more! Privacy. Take classes in your own space, at your own pace. Rewatch as many times as you need! Growth. Weekly "homework" and tips designed to help you build your skill faster and more efficiently. Plus. Lifetime access to the classes to review anytime you need a refresher! Plus: Live call at the end of the course where we'll go over how to talk to your clients about transitioning to balayage, pricing and any questions you may have accumulated through the course! "I recently signed up for Jessica Wilburn online course “The Art and Skill of Balayage” that she has created along with this FB forum “Balayage & Advanced Color Education & Discussion” and I want to share with you my experience with this course. Let me first say that after watching a lot of YouTube Videos on balayage and purchasing CD’s on this subject along with hours of practice on mannequins I was still struggling and frustrated by this elusive (at least for me) skill that I so desperately wanted to master. I then signed up for a “Hands On” course with a well-known company and got certified by them- it was very expensive but I really wanted to master balayage. Six month after that class, I made another investment in Jessica’s class and it really built on what I had learned. I feel that it has reinforced what I have been taught and the class has refined my technique. Jessica Willburn has very good tips and advice on how to perfect your painting and is ALWAYS available to answer questions that you might have even after the six weeks is over- something that was not available to me with the other course. So if you happen to be in an area where getting education is difficult or finances keep you from such a large investment you will find value and the tools you will need to be successful with this online course plus, you get to build the support group that you need to flourish. Sometimes we work in places that are not supportive so it’s great to have an online community to help you along. I’m really glad I made the investment! WEEK THREE: Ombre. How to paint seamless and melted (without backcombing or 5 toners to blend it). WEEK FOUR: Heavy blondes and retouches. Two classes! One for those blondes who want/need balayage but want to be SO blonde. Another for how to touch up your balayages! WEEK FIVE: Balayage With Color. Two classes again! How to paint with a root touch up on the hair processing, as well as how to do "reverse" balayage or "low light" with balayage. WEEK SIX: Short Hair Balayage. Painting on short hair is delicate work, this class will help you break your creative limits and learn more about placement and application! Jessica has taught me so much about hair and how to be a successful hair colorist. My favorite thing in my first year of doing hair was watching her paint hair, her skills and precision were as close to perfect as you can get. She never made me feel pressured or intimidated and always answered any random question I had with an open mind. I am now 2 years out of training and am booked out for weeks for my returning balayage clients and new request balayage clients. I owe a lot of my success to Jessica and her training and would highly recommend a new or experienced stylist to take her classes! "This class really pulled together for me all the various looks of Balayage and gave me a foundation to achieve them instead of grasping at the myriad of YouTube videos. Also solved problematic areas with the ability to ask questions. Is it pricey? Yes, but my clients deserve the best I can be and good education usually is." I took Jess’s amazing balayage course about a year ago. I didnt have any hesitations for signing up for her classes. I followed her on instagram for awhile and LOVE her work shes absolutely amazing and so good at what she does I was so excited to take her coarse. My business has changed SO much since this program. I'm a first time momma and can't work as much and because of this course I'm able to work 3 days a week!! My entire clientel is now balayage, which has always been my goal. This course has helped me to perfect mt skill and get 100% comfortable with handpainting. My time is is cut in HALF, beautiful seamless blends, learned about adding dimension in at the same time while balayaging to cut down on time and so much more that I had struggled with before. I also love that Im still able to go back and look at all the videos whenever I want! If your unsure about taking this coarse, don't be! You definetly get your moneys worth and even when the course is over shes open to anwsering any questions you might have as your still practicing. Shes all about sharing her knoledge and helping you grow your business and thats exactly what I’ve gotten from this program and im so thankful for that! I can now stay at home part time with my little girl and when I am working Im able to do what I love with confidence. I'd like to invite you to join my Facebook Group for Balayage & Advanced Color Education, this group is a safe space to ask any color, balayage, or business building questions as well as a place to post your work. Please read the group description for our requests for posting. Hope to see you in there! Want to learn more about Jess? Click "artist" below!